Time is incompressible and priceless. The permanent instantaneity in which we live in has made us more alert and slave to notifications. Here are 15 productivity tools to gain serenity to spend more quality time. This subject has fascinated me for a while. Over the years, I developed my own tools and spreadsheets. Gradually I discovered that there were lots of productivity tools to help us with our daily tasks. It helped me do a lot more with less. I have listed my best productivity tools to save you time. You will surely know some of the services mentioned. I offer you a different reading through the story of my day to see how I integrate them. All of these tools are free with a premium offer available to unlock advanced features. 8am, the alarm clock rings. I start with my morning routine: meditation, breakfast, writing, reading before getting ready to work. The advantage of working from home, we are very quickly operational and it saves transportation time. After reading Miracle morning, I decided to test not the alarm clock at 6am but the principle of morning routines. I quickly realized the benefits. Devoting time to personal development will always be our best investment. Even before you start to work, you simply spend an hour looking after yourself. Nothing else. What better way to start your day? An extra motivation to get off to a good start by just doing activities that you enjoy without hurry. This gives another rhythm to your day, a positive one. I will come back to this subject in a future dedicated article. It will soon be a year since I started meditation. What a world I discovered ever since, my thoughts. I mostly realized how much our mind was cluttered with thoughts, between 50,000 and 70,000 a day… Our brain is constantly thinking, not giving us a second of relief! I tested a lot of meditation apps before making a choice. I will propose my selection later on. I chose Headspace. Everything speaks to me in this application. It is just wonderful and sublime. The voice (available in several languages), the countless themes (happiness, sleep, visualization, kindness, prioritization, finding focus…) and the magnificent illustrations. Their videos are really worth the detour. In terms of ergonomics and design it is a good example to follow. During my first session I had not managed to follow all the indications because my thoughts were too numerous. There was like a hurricane in my mind. As the week went on, I was able to observe the progress. I had less and less thoughts that prevented me from listening to the narrator at each session. Being aware of your thoughts without judging them allows you to take a lot of distance. I quickly realized what polluted me every day. I was surprised how anodyne information could end up bothering me. Put it simply, I was concerned by all of my friends problems. Every day I would receive messages with their problems and I would spend time cheering them up or help them solve the issues. I simply stopped all of that noise by removing all of the social network apps from my phone. My thoughts started to shift and I could be more focused at every session and naturally found more time. Since I started my journey as an entrepreneur, I have been paying a lot of attention to my mental load. There are so many things to think about at once and to anticipate. Meditation can become a solid companion to help us press on the pause button. Useful for learning to put aside negative thoughts, to make room for new ideas and to be more creative. A suspended moment that I enjoy taking daily. 9am, my work day always starts with this same action. I open Station, a desktop application that allows the management of my entire workstation in a single window. No need to open multiple navigation windows and have many floating windows. It works with icons in the left sidebar. You can navigate from one application to another very easily. This is similar to Slack in terms of ergonomics but includes all your tools at once. Customize your workstation to your liking: Gmail, Google Calendar, Google Drive, Slack, Trello, Evernote, Maps, Medium… They count +600 apps available. No need to access a browser anymore, avoiding being “unintentionally” on Facebook and scrolling mindlessfully. How can the service help you? Let’s say you use Gmail professionally. It is not uncommon for you to even have several email addresses in addition to generic emails (contact, info, job, press…). You have either a mail client to aggregate these or multiple tabs open in your browser. You use Google Drive as a collaborative tool and you want to keep an eye on your calendar. Slack is always opened to interact with your fellow coworkers. 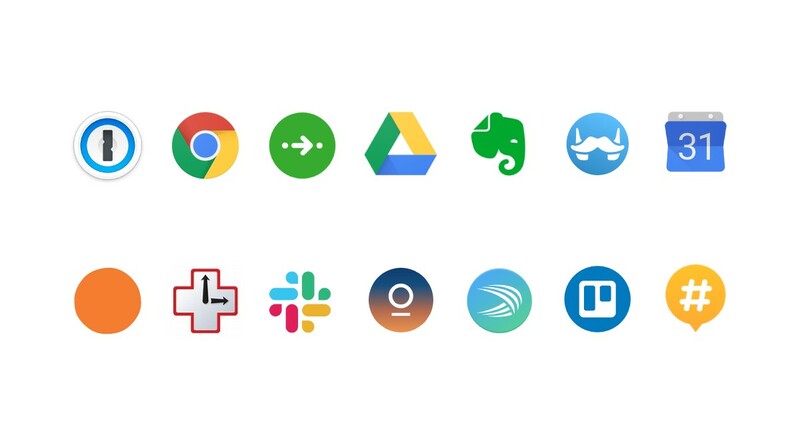 What if all these tools were grouped into a few icons within a single window? You would switch more easily from one icon to another naturally. In addition, you can add other tools like Trello, Maps, Evernote etc. You gather all your business tools into one window. The only small flaw? It can’t aggregate all your Gmail accounts into a single icon, as it is the case with Google Drive documents. This makes us lose a valuable space in the left sidebar. I wanted to notify it because a competing alternative, Shift, is offering a different approach which would be more convenient to some of you. You have your gmail account in an icon but you also have a top bar to access your calendar and Drive which allows you to save icons and space in the left menu. The use of Station has clearly helped me to be more productive! I placed it in third position of my favorite productivity tools! I take a look at my Google Calendar. To organize easily, I use color codes to define the nature of my appointments. Blue for professional meetings, salmon for my personal appointments , gray for sport (blocked in advance, no excuses), green for doctors, purple for concerts, lavender for my cultural outings, yellow for holidays. If you are a visual learner, you should find this very useful. I like to schedule 1 to 2 days (Tuesday and Thursday) in the week to gather all my professional meetings at once. It saves me from wasting too much time commuting. If you are aware of your productivity peak during the day, you can stall your more complex tasks on these time slots. The most rigorous even divide their day into 100 blocks of 10 min. Some prefer to start with tedious missions, called deep work. It’s up to you to see what suits you best. My secret weapon? Reminders. For each day of the week, I plan one to three important tasks. In the evening I usually check if they are noted as completed. If not, I re-schedule them at another time. I usually create a lot of reminders because it helps to lighten my mental load. A created task can be immediately forgotten until the day of the reminder. No need to think about it relentlessly anymore! I especially saw the difference during my meditations. Adding a thought immediately as a reminder is a great way to ease the mind. I use reminders in real life too with post-it. If I need to remember something before leaving a place I will stick the post-it near the door handle for example. For example, I create 3 columns: “To do”, “In progress”, “Done”. In the “To do”, I create themes: Marketing, Community management… Within each theme I will write a model / guide to be followed step by step in the form of checklist with checkboxes: “Program the post via Buffer on Facebook, Instagram, Twitter and LinkedIn”, “Add the article to the Excel spreadsheet on Google Drive + url”, “Find 5 alternative titles to re-schedule”. This allows you to have a useful model to follow when working in a team, placed at the top of each theme. Although I could add Slack and Messenger into Station, I have deliberately chosen to dissociate them by adding them to Franz. Messaging is simply the plague of productivity. Whether it comes from Messenger, Whatsapp or Instagram, you are always solicited. So, if I do not open Franz, I receive absolutely zero notification from these platforms — I have uninstalled all of these apps from my phone and here is what I can tell you about it: what a peace of mind! So I deliberately choose the moments I want to communicate and answer to messages. This makes it possible to no longer be polluted unnecessarily by all the notifications and to regain productivity! Trust me, you won’t miss a single app. 10am, it’s time for me to leave. I have a coffee meeting at 11am in Paris. I open Citymapper, the multi-transport application to find out how much time it will take to get to the coffee place. The application indicates the best route in a single page through several possible modes of transport: metro, bus, Uber, bike and scooters! An interactive map geo-locates the various transports around you: metro stations, bus stops, city bikes, scooters, Uber, on foot… Once you have selected a route, the application warns you with a vibration when you are close to your stop. Google Maps launched this feature thanks to Citymapper. The killer feature? We are told where to place in the subway train. You will find yourself facing the good metro exit upon arrival at the station. Magical! Second appreciable point? The indication of the correct exit number. You don’t need to check the old map anymore to know which exit to take. Citymapper will tell you so. To not spoil your pleasure, the application is available in many cities around the world: Paris, London, Berlin, Los Angeles, Mexico, Sydney, Hong Kong, Montreal, Moscow…! I really like the waiting animations and offbeat information. We are even given the travel time done in… Hoverboard! One of the best apps that exist in terms of ergonomics and user experience. 10:15 am, on the way I take notes of my ideas on Evernote. This is undoubtedly my favorite productivity tools. If you only had to pick one tool from the list, go for this one. Today it would be impossible for me to organize without all my notes in the number of +400 at the time of writing this line. Imagine the application as the Dropbox of notebooks. All your notes are synchronized on all your devices (Mac, PC, smartphone, website). Impossible to lose a single piece of information. I started this article in the subway on Evernote while my phone was offline. It then synchronized automatically whenever I had a connection. I finished writing the article on my Mac later on this day. You can classify your notes in different binders: work, personal, association, sport etc. Its particularity? The ability to enrich the notes of images (photos, gifs), tables, voice memos, checkboxes (perfect for shopping lists or To do lists). You can collaborate with other users by sharing the note. They will also be able to contribute. The most amazing feature of Evernote is its extremely powerful and advanced search engine. Just type a word to highlight the corresponding notes. It is able to recognize words on images. The latest feature? Models / templates available ready to use. The little fright? One day, I deleted a very important part of a note. I hulled Google to see if it was recoverable. Note that in the Premium version, there is a history of each note, I was saved! The small regret? An effort on ergonomics would be appreciated. The different menus make the tool a little complex and repel at first glance. Thanks to Evernote, I ended the note taking on notebooks that I never ever read once. I take my notes directly online to be able to classify them immediately and find the information later on if necessary. A big thank you to the Evernote team for this wonderful tool that accompanies me daily. So fond of it! 10:45 am, checking my emails, I received the weekly report of Rescue time. This service allows us to monitor all of our connected time. By that, I mean all over the web with a Chrome extension to see how much time is spent on each website, an application on the smartphone to see the time spent on apps and a desktop app for the computer. 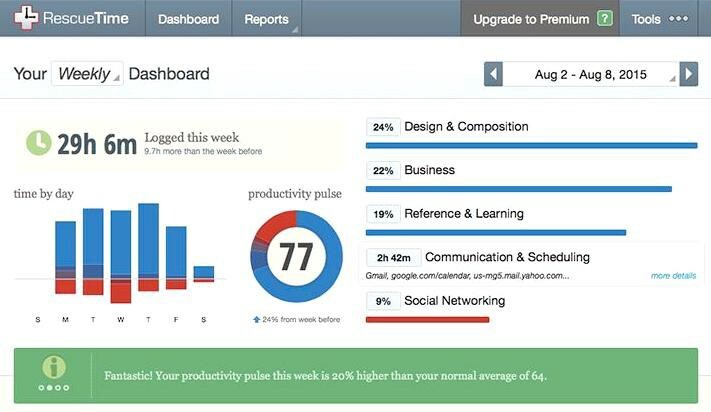 RescueTime will send you a weekly summary about the time spent on each service. It will be categorized: Business, design, learning, communication, social networking. You can change the categories by yourself. For example put Facebook as productive if you use social networks professionally. You will be able to observe your productivity in every aspect with different graphs. You can use it punctually by disabling the service manually or schedule time slots of observations. During the first weekly report, it allowed me to eliminate time-consuming items such as games from my phone. I removed the Instagram application on which I spent too much time messaging. Spoiler alert: it won’t even miss you a bit. 11:00 am, I send a text message in 3–4 letters and 5 clicks to my contact to indicate that I just arrived. Yes you read well, I speak in letters and clicks because I have a magic keyboard which is my second favorite tool of the list. It is called Swift key, available on iOS and Android. The service saves our most used words to predict them in a line just above the keyboard. For this it uses a network of neurons, artificial intelligence. I often start my messages by “Hello, how are you?” which is worth 2 clicks in the center of the keyboard and a question mark, a total of 3 clicks. I often just slide my finger through the keyboard and am amazed by how effective and right they find the right word. The keyboard also has a bunch of tools available. My favorite one is the copy-and-paste feature. It will memorize your 10 latest copy and paste during the last hour. It does not matter how long your texts are. You can also keep them as favorites indefinitely. Convenient to save your details info such as your address or your 30 hashtags for Instagram! You can view your calendar to send appointment dates without even having to leave the conversation. You should test it as soon as possible. For fans of gifs, it also includes a well-stocked library. Latest feature, a translator. 11:30 am, my appointment is underway. I take all the necessary notes on Evernote. Finish the notebooks with pen to lug around with you. I appreciate the fact that everything is already transcribed and synchronized on my computer once I am done with the appointment. No more loss of information or time. 12:00 pm, end of the appointment. I open Franz to consult Slack. You must certainly have heard of it already. This productivity tool is the Rolls Royce of communication tools. To try it, is to adopt it. The main menu is on the left (similar to Franz and Station) and can be divided into 2 parts. First there are the channels commonly called “Channel”. It exists by default “general” and “random” but you can add more channels according to your needs such as “marketing”, “development”… In each channel you can add the collaborators concerned by the subject. This avoids being polluted by topics that do not concern you. You can create private channels too. Ideal for confidential projects or to organize farewell parties secretly. At the bottom of the left menu you will find the second part, direct messaging. You can communicate privately with a colleague but also create grouped messages. This communication tool is particularly suitable for small teams and especially remote teams. Videoconferences can be done directly via the tool. Here are some possible integrations: add Twitter so the team can see the posts of the company’s Twitter account, integrate the Intercom chat from your website to answer directly to the visitors in a dedicated channel. You can even add the received emails on any mailbox. Handy to manage generic emails like “hello@mycompany.com” by every member of the team. A tool adapted to overcome the retention of information. Seeing in one window all the history and progress of a topic / project makes it possible to gain in efficiency and take over more easily. A considerable time saving way of working. 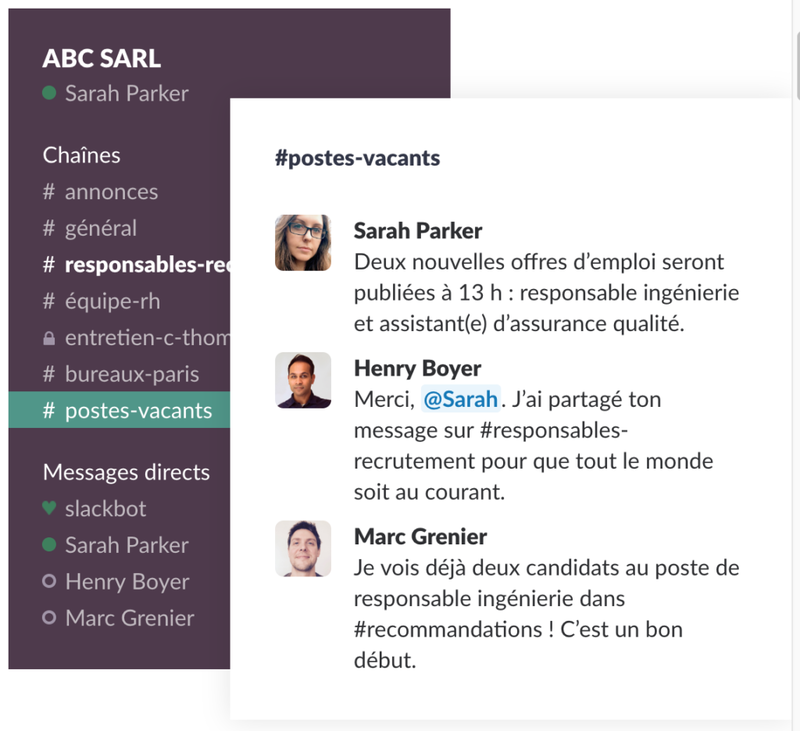 Slack’s flaw? As your team grows, you will likely receive more notifications. It can quickly become time consuming and counterproductive. In my previous work, we had to put in place methods of use to regain productivity. 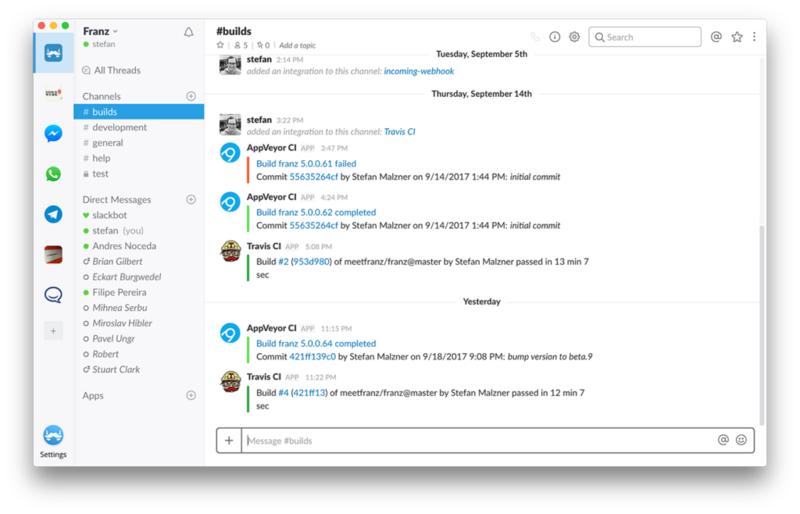 I wrote an article on the subject, Best Practices For Slack: 6 Hacks To Save You Time. 12:10 pm, on Franz I have a question on Messenger about Buffer. A tool to schedule and post on your social media. To check an information, I head to their website. I use Google Chrome, I regularly test new Chrome extensions. They are largely part of productivity tools. - Bananatag tracks the opening of your emails on Gmail and you get notified whenever your links are being clicked. 5 emails tracked for free daily. - UglyEmail prevents the tracking of your emails (read notifications). Works well to counter those who use Bananatag for example haha ​​On Gmail, you will see the icon of an eye appearing to tell you which of your emails are tracked. - Emoji keyboard helps you find the right emoji for every situation. Just type a keyword (in English) to get the related emojis. By clicking on any emoji it will immediately be copied. Click on several emojis and you will copy a series of emojis. Clearly one of my favorite extensions! We no longer waste time scrolling to find the right emoji or category of emojis. We write a word, we get suggestions of emojis that we didn’t even think about. 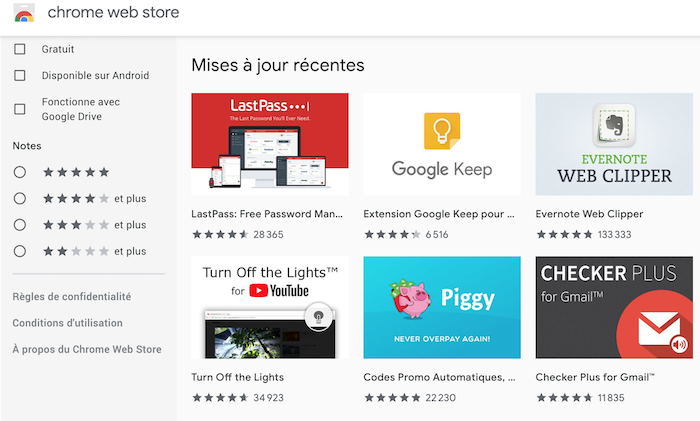 - Pocket saves in one click the website you are currently browsing. You can then read it later on your smartphone or on your browser anytime you want. Also a perfect way to save relevant information. - Google Calendar opens your agenda in a panel. You can have a quick look at your meetings of the day or create an event right away. While visiting a website, it can detect events to add directly to your agenda. - No need to present the infamous AdBlock to prevent us from displaying advertisements on any websites. There are so many of them, I will write an article by category later! Beware, do not add or activate too many extensions at once because it may slow down your navigation. It can also change the behavior and display of some websites. You can enable and disable your extensions in Chrome settings. For those who navigate in private, you will have to manually activate each extension in private mode in the options of each of them. Let’s get back to our business shall we? To connect to the Buffer website, I click on the 1Password extension. It automatically logs me in without having to type down anything. It’s simple, I do not remember any password since the installation of this password manager. It fills all the information instantly. The only password to remember is the one to access it. The advantage of 1 Password? It’s available everywhere, on your phone if you need to verify a password, on desktop app, on your Chrome browser and on their website. It gives advice on the vulnerability of our passwords and suggests a complex password generator. Pretty useful! 12:15 pm, I keep on writing this article. I open Station to use Evernote. Once completed, I copy it to Google Drive, also present in Station. This will allow other members of the team to make corrections before posting it on the blog. I would know it thanks to the last modifications made appearing on the top menu. As on Word, they can also comment on parts of the document. Google has made the right bet by making available on the cloud all of its Office suite. No need to download the Office Pack anymore on your computer, everything is available online for free and collaboratively. If you use the business version of Gmail, Google Suite, you have an associated Google Drive space available. Perfect for synchronizing all of your company documents in one place! No need for a VPN. 1 / Permanent access: each member of your team has a constant access to all the updated documents of the company. Storage space accessible from anywhere and anytime. 2 / Personalized sharing: the sharing of folders / files is customizable and can be restricted. 3 / External access: you can give access to anyone having a Gmail account or using Google Suite. 4 / Avoid the retention of information: useful when a collaborator leaves the company. Previously, they could erase all the documents from their computers before leaving and you wouldn’t know a thing about it. Bummer! Now with Google Drive, everything is online and recoverable anytime as there is a history and you can go back in time. Period. A huge problem however with Google Drive… We must regularly ensure access for external collaborators who have surely used a private Gmail account. Meaning they still have access to the company’s files after they are gone. This lack of access management affects the confidentiality of corporate data. A significant point for Slack users: if you are using the free version, just communicate the link of your Drive document instead of uploading the document each time. This will avoid you to reach rapidly your storage space limit. 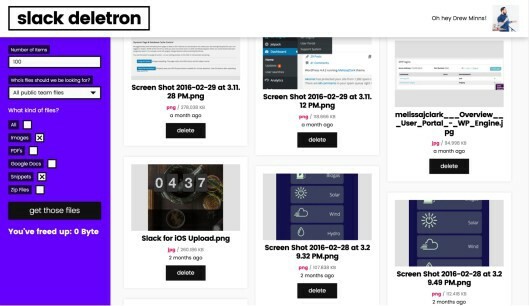 Should this happen, however, you can still use Slack Deletron to delete all of your files at once. Finished the chore of shouting to your collaborators “Can you erase all of your Slack files please?” in the middle of the open space. Be careful however to save your documents before this irreversible action! It is 12:40 pm, time to take off for my lunch to a new address that I could propose thanks to Mapstr. The application is ideal to add all of your favorite places and the latest trendy ones to try. It is so simple to use. You type the name of the place and use tags to easily sort the places out if needed later. All the places then appear on your map. Before, I could spend a considerable amount of time finding the right place to meet. I would think about the subway station and places nearby or even ask some friends. From now on I have Mapstr and what a relief it has been ever since! That’s why it totally has its place in the list of productivity tools. As soon as I spot a place that I would like to discover — of any type, restaurant, bar, rooftop, shop, museum, I add it on my card with personalized tags: to try, rooftop, bar, brunch, dinner, Italian, bio, etc. The highlight of this application lies unsurprisingly in its map. When you are in a neighborhood without knowing where to eat lunch or dinner, just open the application. No need to think, especially if it’s always to end up to the same places! Since I have the app, I have been able to test more new places. The advantage? We can access our friends’ maps or influencers’ maps to test their addresses anywhere in the world. Do not hesitate to follow me to discover my map. Another useful tip, since it is geolocated, you can add places all around the world. You don’t need to take visit cards anymore. If a friend is visiting the same city as you did, they will be able to find the places you loved and read your comments about it: “best napolitan pizza of Firenze”. Bonus track, it’s not over! It’s the one that captured my heart for several months now… It’s named Alexa aka Amazon Echo. You can also add apps / skills to listen to such as Audible, podcasts, ambient sounds and even meditate. They are still few in number but the supply is expected to grow. My days are punctuated by “Alexa play Spotify”, “Alexa Neeeeext”, “Alexa switch on the living room”, “Alexa add eggs to the shopping list”, “Alexa launch a timer for 10 minutes, “Alex, what time is it?”, “Alexa, what is the weather like?”. My setup: 1 Echo (with a better built-in speaker), 1 Echo Dot and 4 connected plugs (only on lamps). It simplifies my life and in results: productivity on point!! My best purchase of 2018 for sure. Managing your agenda is a real deal… There are a plethora of productivity tools, I listed here my favorite ones. Integrating all of these tools is not going to make you more productive. I gradually integrated one tool after another based on my needs and “hunt”. They have since become essential to me. Like all productivity tools, the hardest part is to find the ones that work for you and your team, and then promote their adoption. Upcoming: more thematic articles to share with you the ones I use for social networks, graphic design, lead generation, networking, recruitment, monitoring etc. The goal is to share a maximum of resources and best practice that can save us a great deal of time to… enjoy life! What are your productivity tools and your recommendations in their use?